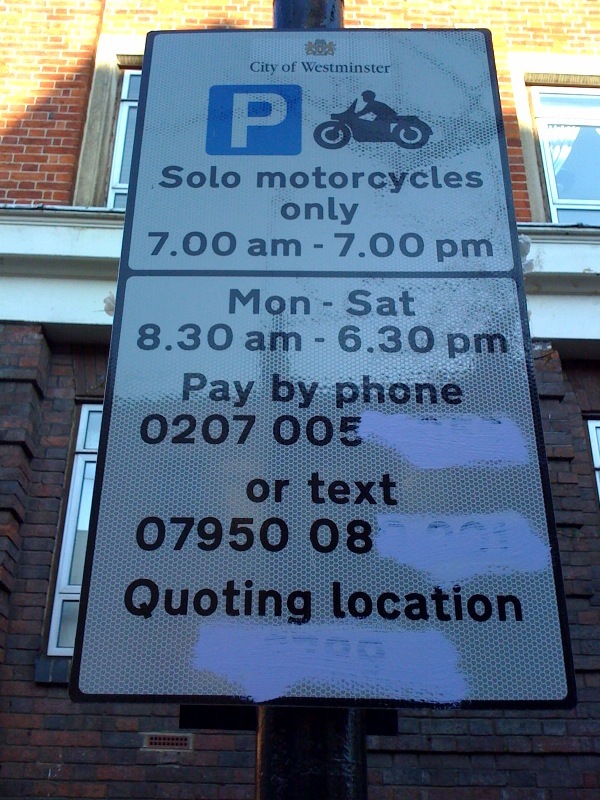 Westminster’s Tory Councillor Danny Chalkley has recently announced his decision to make his unwanted motorcycle parking tax permanent, while a group of angry bikers have been defacing parking signs which provide instructions on how to pay the tax. When parking signs are defaced, the charge cannot be enforced, as the details required to pay the tax are not clearly visible. Any PCN issued in such circumstances is not valid and must be cancelled. 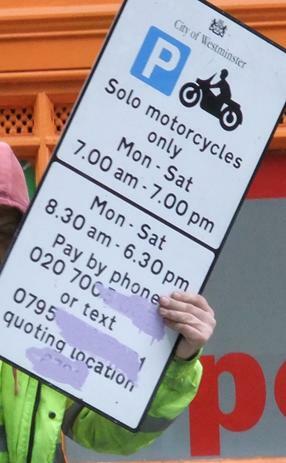 A lot of bikers have recently taken advantage of the defaced signs to park their motorcycle in Westminster free of charge, thus saving money for the benefit of better causes than this robbery scheme imposed by a Tory Council with a huge financial appetite. 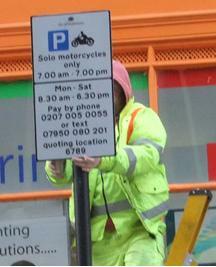 In the last few days, we didn’t come across a single motorcycle parking bay in Westminster that had no defaced signs. However, in the last 24 hours or so, Westminster Council have sent out a team of “cleaners” to either replace the damaged signs or clean them up, in order to make the parking tax enforceable again. We are not sure where all this is going to end up. While UK France Bikers.com is not involved in any form of vandalism as a way of protesting against Chalkley’s ridiculous and punitive attack on motorcyclists, we don’t believe that, as the signs are being cleaned up or replaced, they are not going to be defaced again, thus forcing Westminster Council to provide on-going free motorcycle parking. 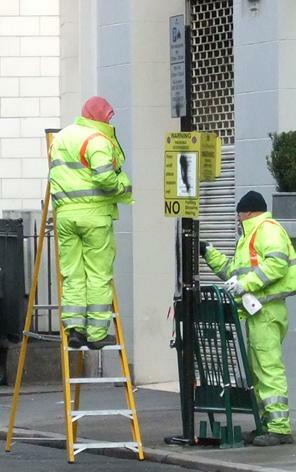 The last time when parking signs were defaced was in June 2009 and Westminster Council spent around £200,000 of taxpayer’s money to replace and clean up the affected signs. Only a number of them were defaced at the time, but now it appears that the whole City’s motorcycle parking signs are being defaced, cleaned up and replaced, thus likely to cost the Council a small fortune, especially if this becomes an on-going activity until the tax is permanently scrapped. Anyway, when it comes to grabbing money from the public, this Tory Council is constantly on the move, but when it comes to providing information to the public about its crappy services and third world motorcycle parking facilities, the same Tory Council can’t be asked to update their website. You can check out this link to find out more. If you park your motorcycle in a bay with defaced signs, do not pay and click here to find out what to do in such circumstances. I find it absolutely unbelievable that Westminster consider the clean up or replacement of defaced motorcycle parking signs as a higher priority than treating icy pavements where pedestrians can injure themselves. One brings money in and the other doesn’t, that’s why. Disgusting and typical from the Conservative Party. Let’s hope that the newly cleaned or replaced signs will be defaced again. That’s the only thing that these politicians understand. If Westminster Council gets away with taxing bikes to park, they will get away with anything they want! Why are they so desparate to discourage bikes in London? Who is benefiting from this tax? Where is the money going, in the pockets of the councillors or their friends? It makes you wonder? The poeple we elect are ripping us off big time, remember this next time you walk to the polling station you may have to pay a pedestrian tax in the Tory run Borough of Westminster. Easy Louise: it’s going to the shareholders of the foreign-owned Verrus who run the system. It’s real ‘spend-a-buck-to-make-a-buck’ philosophy. It doesn’t benefit the residents or traders in Wastemonster, it costs the council (taxpayers) money to run and NO-ONE wants it except for the self-serving councillors who must be getting some kick-back for promoting and driving this awful scheme. At last someone is standing up to the bureaucrats who serve themselves at our expense. They will be fought at every turn, by peaceful demonstration, legal challenge and random, independent acts of defiant protest to expose the system as the flawed and despised tax that it is.